5 April 2018. Webinar. 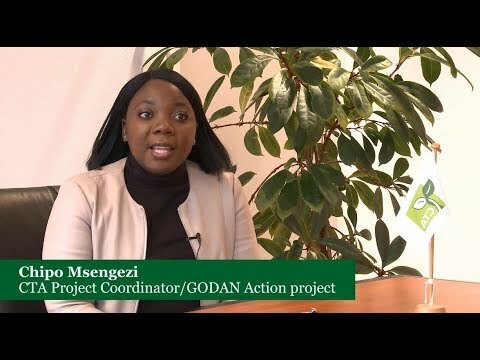 As part of its work on farmers’ rights to data and following up on the face-to-face course on Farmers’ Access to Data organized in Centurion in November 2017, GFAR continued its collaboration with the Global Open Data for Agriculture and Nutrition initiative (GODAN) and the Technical Center for Agricultural and Rural Cooperarion (CTA) on a series of webinars on data-driven agriculture, its opportunities and its challenges. Data-driven services and products are coming to be seen as promising mechanisms that farmer organizations – cooperatives, associations, enterprises, etc. – can use to better serve the interests of their members. Data-driven services can be used for improved production, trade and market access or finance, among other uses on the value chain. This data can be in numerous forms – collected from the farmer, for the farmer, open or closed. Farmer-representing organizations offer great opportunity to safeguard smallholder data, maximize returns in value chains, and best exploit the potential of third-party services and data offerings. This all relies heavily on efficient farmer profiling activities which will allow the farmer organizations to connect better with their members and deal with third party service provide. 14-16 June 2017. Ministerial Conference and 4th Agritec Africa Exhibition The Ministerial conference mobilized high level political support to ensure availability, accessibility and usability of data for agricultural planning and decision making in the global south. 15 – 16 September 2016. GODAN organised a global summit in 2016 for all its partners to move forward the agenda for open data in agriculture and nutrition. 28 – 29 November 2015. Durban, South Africa. 3rd PAFO Continental Briefing Advancing African agriculture through agribusiness developmentData-driven farming, Big data and Precision Agriculture: This session looked at new opportunities offered by Big data and ICTs successful applications to farmers in various areas supporting agribusiness. 19 – 20 January 2015. Wageningen, the Netherlands. Wageningen University and Research Centre. The GODAN workshop “Creating Impact with Open Data in Agriculture and Nutrition” was hosted by the Dutch Government (Ministry of Economic Affairs) and was open to a broader public; the Partner conference was for GODAN partners only.